We are so excited to celebrate International Women's Day by introducing you to some of our 493 scholarship recipients for this year! Photos courtesy of our Cameroonian Partners Calvin (top) and Yacouba (bottom). To learn more about the students you've helped us support this year, please visit our website Thank you for supporting our mission to provide educational scholarships to girls and women so that they may increase their knowledge and empower themselves to lead healthier, more productive lives! We'd love to celebrate with you at our upcoming events! We will participate in the Cause + Event 5k 5k on May 12th! 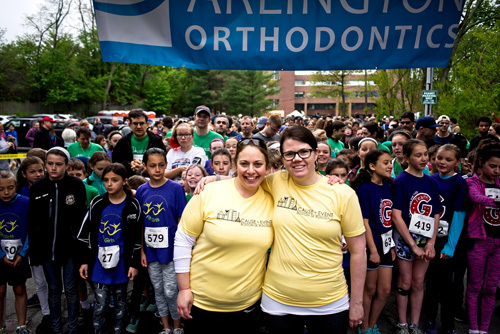 This race can be run in person, in Arlington, MA, or virtually around the world, and at least half of all registration fees go toward the nonprofit team of your choice! This is a great family race that will sell out early, so please register soon! affects A2Empowerment and other nonprofits working around the world in a similar style. The major change will be that we are no longer permitted direct communication with Peace Corps Volunteers and all decisions, including scholarship selection, will be decided on by Peace Corps Volunteers and their communities. We will receive final reports on projects and, as before, all funding will be strictly monitored by Peace Corps. To supplement our program, we are working to increase and strengthen our work with trusted Cameroonian Partners to offer high school scholarships. Cameroonian Partners will operate as they have done in the past by sending student applications to A2Empowerment for evaluation and providing direct feedback. Last summer A2Empowerment was honored to receive a $10,000 grant from The Minneapolis Foundation. To aid communication, oversight, monitoring and evaluation during this time of transition, we are putting part of this funding toward the part time salary of our first hire, Mr. Buba Dicko Sulle. Buba is an educator who is a strong advocate for girls' education and has served as a mentor for A2Empowerment for several years. We are grateful for your patience as we work through this transition. Reserve funding and any donations contributed during this transition will be put into a high yield savings account, so funding will grow until we go back to awarding higher numbers of scholarships. One way that several Friends of A2Empowerment have supported us is through the presentation of networking opportunities. We will start highlighting these invaluable contributions. Mariana Nacht has gone out of her way to support A2Empowerment, including by introducing co-founder Anne Cheung to Penelope Riseborough. Penelope is the Director of Communications, Marketing and Fundraising at World Education, a $42 million nonprofit working to improve education in 24 countries around the world. Penelope applied her outstanding communications experience to advise us on our website and ways of increasing our outreach. One thing Penelope pointed out on our website is the lack of information on us, the A2Empowerment Co-Founders. We were actively trying to minimize this information because we want the focus to be mainly on the scholarship students, but Penelope feels that it may be inspiring to hear how we started A2Empowerment. If you'd like to learn more, please click on our pictures below. Thank you to Mariana and Penelope for inspiring all of us! We are grateful for your support and trust. Wishing you an amazing International Women's Day! We are grateful and excited to announce that we will be awarding 493 scholarships across Cameroon in 2018! This upcoming school year we are working with 27 Peace Corps Volunteers and 3 Cameroonian Partners to mentor motivated young women at high risk of dropping out of school. Photo of 2018 scholarship recipients from Bambalang, in the North West Region of Cameroon, courtesy of our Cameroonian Partner Roland Nchonda Nkwagoh. "My heart is indeed full of joy and gladness for what you people have done to me. That is assisting me to see that I achieve my goal. More so, this great thing that you people have done is not just to make a change in my life but also in the life of my family, my future family, my village, and my community as a whole because, if I finally by grace achieve this goal, I will not only bring a change in my family but also in my community. In addition, what you have done for me has started making a change in my life and I believe it is going to change my life completely." 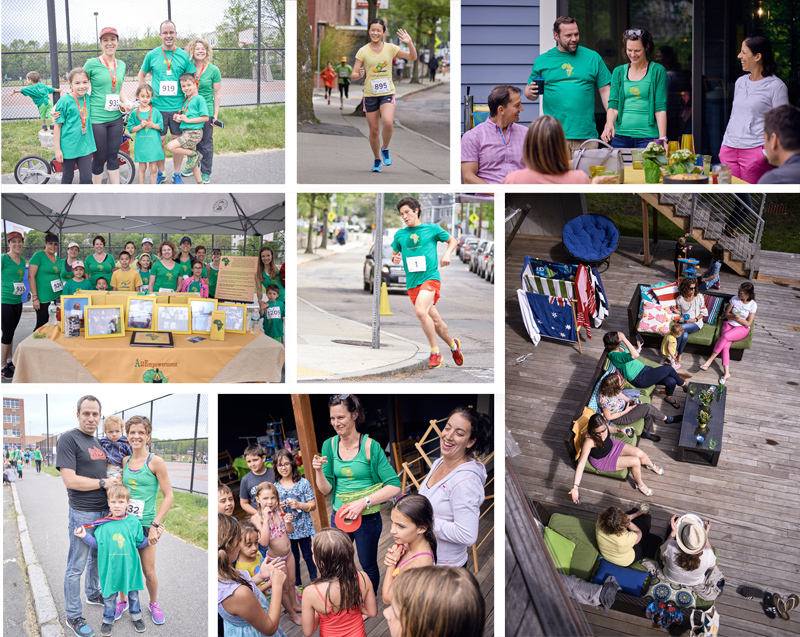 In May, 40 runners helped us raise $1,240 through participation in the Cause + Event 5K! 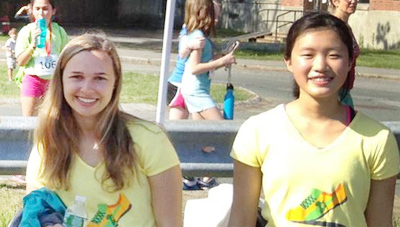 Runners participated here in Massachusetts, and virtually in other parts of the country, to support girls' education! Congratulations to A2Empowerment runners Matthew Campbell and Brian Steinberg, who placed first and second place, respectively, raising even more money for our team! We are so grateful for every participant and volunteer! Special thanks to Mia Rushe, our expo volunteer, Man Ching Cheung, for volunteering his time to photograph the event, Emmett Cook, our youngest runner, and the Cause + Event team, especially Robin Olinsky and Julie Vakoc! 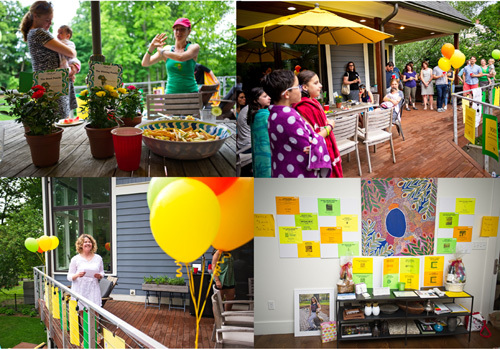 In June, Lori and Pete Whiting graciously opened their home to hold the 4 th Annual A2Empowerment BBQ & Pool Party! We raised a total of $5,700 to support girls' education in Cameroon, through donations, our raffle and company matching gifts! Thank you to all friends of A2Empowerment for their support, especially the Whiting family, Katie Abo, Man Ching Cheung, Christa Houlahan, Deborah Kokinos, Anne Rapin, Lynne Rapin, Mia Rushe, Hongliang Shi, the Wood family, Gail Zichittella, Ink Out Loud Studio, Albertine Press, ADJewelry, Thalia Tringo & Associates Real Estate, Olivia's Bistro Newton, Eugénie Olson, Black Crow Yoga, Wonder Yoga, Not Your Average Joe's! A2Empowerment is officially a Registered Trademark! Anne Rapin and Anne Cheung used their personal funds to support this effort to protect the name of the nonprofit they've worked hard to build over the past 10 years. Thank you to Jacob Weintraub, Esq. for his guidance, kindness and excellent work! 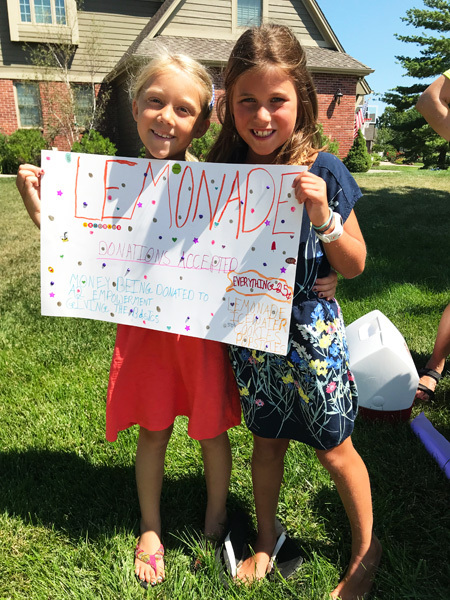 Ruby and Emery sold lemonade in their hometown in Kansas to raise money for girls' education. What could be sweeter than that?!? You can support A2Empowerment scholarships with every Amazon purchase through AmazonSmile! Please consider choosing A2Empowerment as your AmazonSmile nonprofit to give with every purchase, at no extra cost! Don't miss a thing by following us on Facebook, Twitter and Instagram! Happy International Women's Day from A2Empowerment! Nous sommes Ensemble! We are together! We are so pleased to announce we have awarded more than 263 scholarships this school year through 22 mentors in Cameroon! These students and mentors inspire us! As PCV Robert Hartwell writes, "Every day I work with people who inspire me, but not many people can compete with this girl here. Adama is ready to crush it in her first year in high school and further pursue her dream of becoming a nurse!" Our second Bra Project was a success! 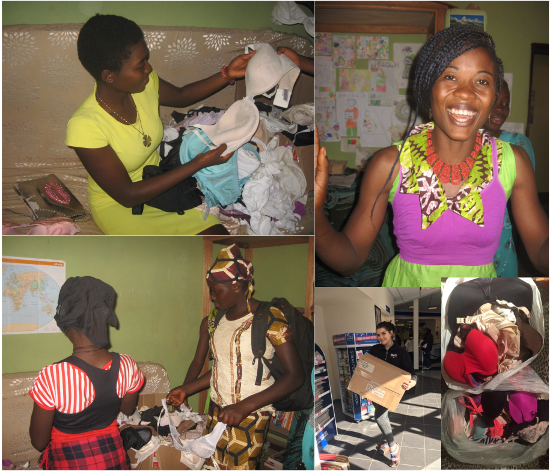 Maeve and Mia Rushe coordinated and funded the shipment of over 200 bras to PCV Gina Dettmer in Cameroon. In February and March, Gina coordinated the discounted sale of bras in her village to raise money to support A2Empowerment student projects, the Widows Empowerment Project in her community and local farmers! Thank you to Mia and Maeve Rushe, Gina Dettmer, Lynne Rapin, Gloria LaSota, Parika Petaipimol and colleagues at Biogen for their efforts! 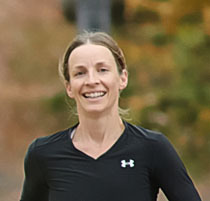 In April, Katie Abo ran more than 26 miles, over 20+ hills (one was 2+ miles long! ), on the Pacific Coast of California to complete the tough Big Sur Marathon, raising enough money to send 37 students to school! Thank you to everyone who supported Katie's training and fundraising! In May, Over 40 runners helped us raise $1,130 through participation in the Cause + Event 5K ! Runners participated here in Massachusetts, and virtually around the world! Following the race, Lori and Pete Whiting graciously opened their home to hold the A2Empowerment BBQ & Pool Party! 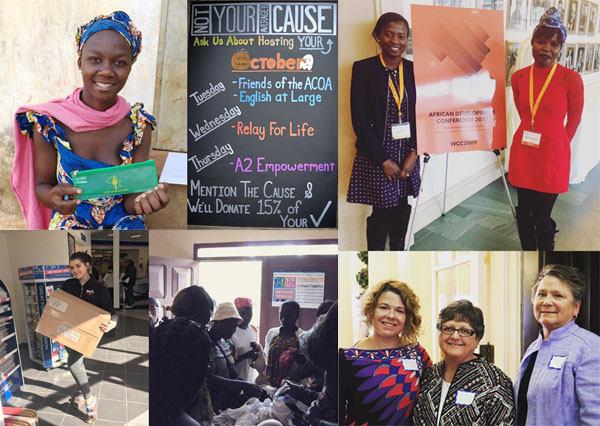 We raised a total of $5,500 to support girls' education in Cameroon, through donations, our raffle and company matching gifts! Thank you to all friends of A2Empowerment for their support, especially Lori and Pete Whiting, Mia Rushe, Maeve Rushe, Johanna and Nate Wood, Deborah and Steve Kokinos, Hongliang Shi, Gail Zichittella, Man Ching Cheung, Katie Abo, Hannah Whiting, Eugénie Olson, Jan Whiting, Black Crow Yoga, Cookie Time Bakery, Dave's Fresh Pasta, Not Your Average Joe's, J.P. Licks, Back Bay Fit, Flatbread Pizza, and Zhen Ren Chuan! Our best wishes to Kalene Resler and Barrett Browne, both Returned Peace Corps Volunteers who served in Cameroon! 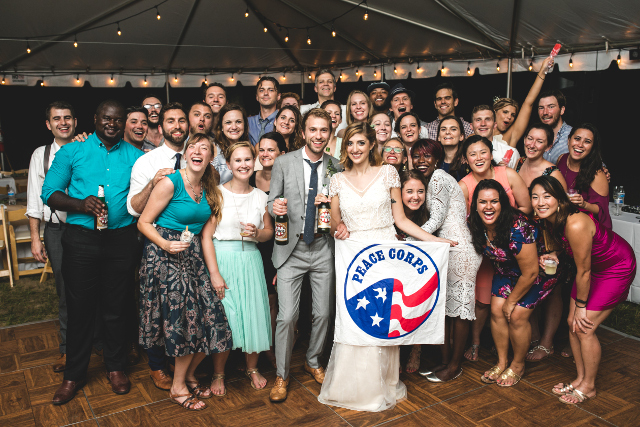 In June, they celebrated their wedding by donating $750 to A2Empowerment as their wedding favor to guests, including many Returned Peace Corps Volunteers pictured below with the happy couple! As a result, they're supporting 10 students in the Extreme North of Cameroon through mentor Nsangou Yacouba! To celebrate Anne Rapin's 40th birthday, in addition to all she already does to support our program, Gloria LaSota pledged to fund 40 scholarships over 4 years! Erica Campbell wanted to do more to help women, so she volunteered to help A2Empowerment! She will begin by writing several blog posts highlighting our mentors and scholarship recipients. If you'd like to volunteer to help with fundraising and publicity, please let us know! You can support A2Empowerment scholarships with every Amazon purchase through AmazonSmile! Please consider choosing A2Empowerment as your AmazonSmile nonprofit to give twice with every holiday purchase, at no extra cost! 2017 Scholarship Cycle: The deadline for the 2017 Scholarship Cycle just closed and 240 applications are currently under review. 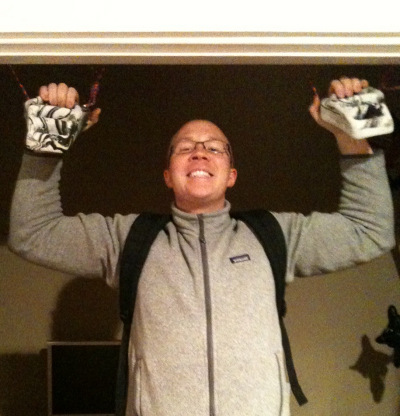 Thank you to all Peace Corps Volunteers and Community Partners who submitted applications! We are deeply indebted to Anne Rapin, currently living in Iraq serving refugee efforts, Claire Kofler, mom to a newborn, and Aly Azhar, newly immigrated to Liberia for work at eHealth Africa, for their efforts! 2016 Scholarship Recipients: We are pleased to introduce you to some of the over 230 scholarship recipients, including 2 university students in Maroua! 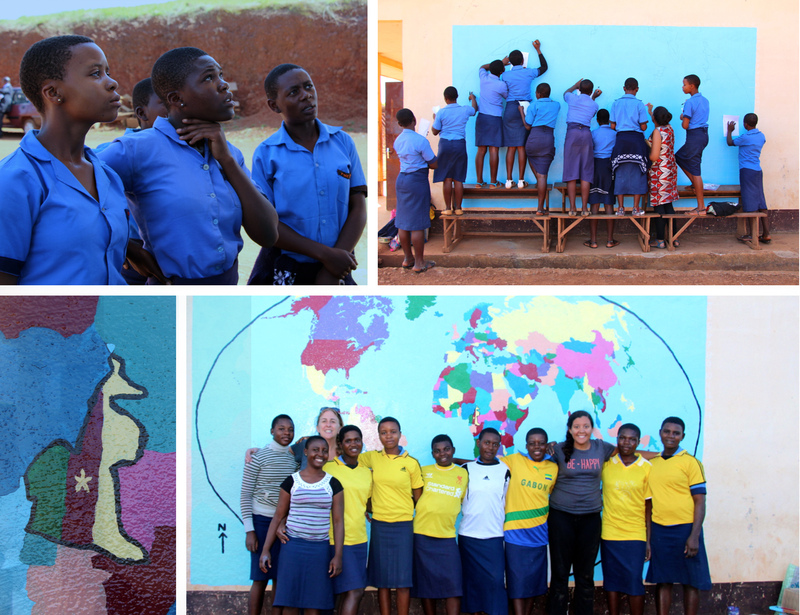 We are all grateful for your support, as PCV Rebecca Castor noted, when she sent us this beautiful photo of thanks, "I have attached a few images of the A2E girls in my community who received the scholarship this school year and the banner they painted to say thank you! We met nearly every week during the school year and talked about the importance of girl's education, barriers they face to continuing school, what their long term goals are, women and HIV/aids, as well as sexual and menstrual health. They even did a monologue for woman's day on the importance of educating girls. I am very proud of the work they put in this year and they are very thankful for this opportunity that you have given them!" Katie! Photo courtesy of Man Ching Cheung. 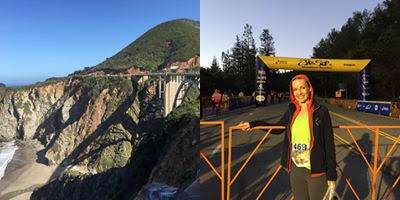 Big Sur Marathon Fundraiser: On April 30th, the awe-inspiring Katie Abo will run the tough course of the Big Sur Marathon to raise money for A2Empowerment! 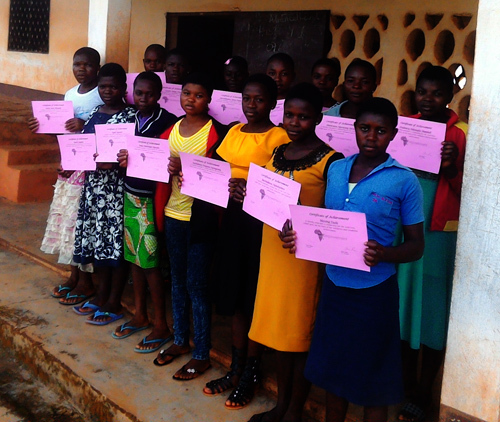 Please show Katie we support her empowering girls' education in Cameroon with a donation! 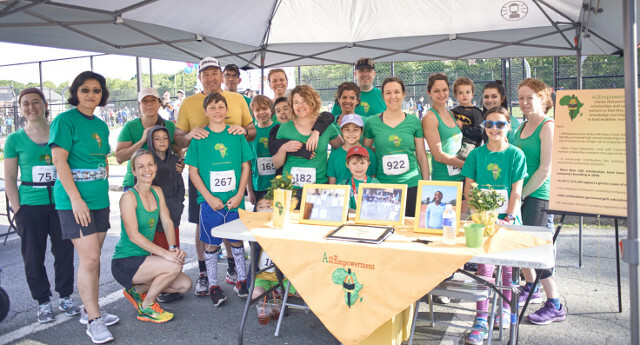 Cause + Event Race: On May 21st, over 40 runners will participate in the Cause + Event Race in Arlington, MA, on the A2Empowerment Team! The race is full, but volunteers are still needed for the race to direct runners! Please contact us if you're interested. Family BBQ and Pool Party: Lori and Pete Whiting are graciously opening up their home for our 3rd Annual A2E BBQ! If you are interested in attending and/or volunteering*, please contact us for further details! We'd love to see you there!!! 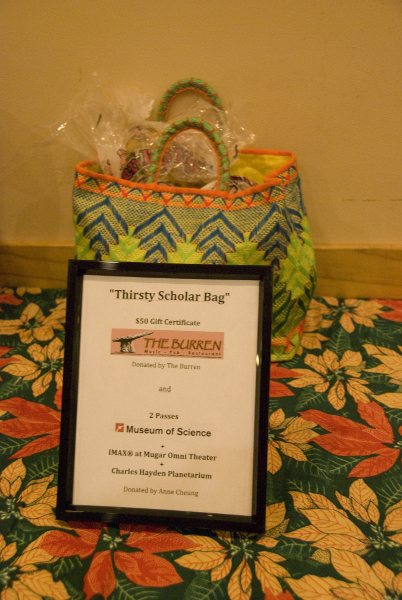 *Even if you can't attend, please consider donating cool prizes for our raffle! Examples from last year include gift cards, legal services, Red Sox tickets, a vacation home weekend in VT, a photo session, and craft items! Gifts for Scholarship Recipients: The extremely generous and supportive Gloria LaSota and Lynne Rapin designed, purchased and shipped A2Empowerment pens and pencil cases to our 234 scholarship recipients in Cameroon! Bra Project: The amazing mother-daughter duo of Mia and Maeve Rushe sorted and shipped hundreds of donated bras to Peace Corps Volunteer Gina Dettmer. Stay tuned to our blog for an upcoming recap! Not Your Average Joe's: Every Thursday in October, Not Your Average Joe's donated 15% of purchases to A2Empowerment through their Not Your Average Cause program, raising awareness for our program and $150! Thank you to NYAJ's, and all of our supporters for participating! Please plan ahead to join us for meals there again in October! Advisory Board Members: In 2016, we welcomed Aly Azhar and Werner Meier to our A2Empowerment Advisory Board. 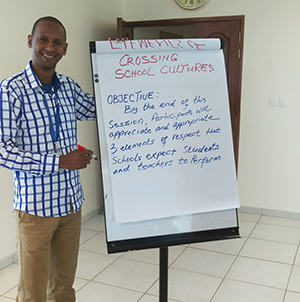 Aly is a Returned Peace Corps Volunteer who worked closely with us as a PCV, and he is working with us to streamline and improve our scholarship process. Werner has been a constant support to our program since its inception, and he is applying his business experience to improve our focus, network and donor outreach. Interns: We are excited to welcome interns Maeve Rushe and Hana Kiros! Maeve is our high school intern and will help with fundraising and social media, on top of the Bra Project she already organized! Hana attends Mount Holyoke College, and, through research and grant writing, she will be helping us take A2Empowerment to the next level! African Development Conference at Harvard University: Over the past year, A2Empowerment was invited to attend both the AWEP Pan Africa Empowerment and Entrepreneurship Conference, in September 2016 outside of New York City, and the African Development Conference at Harvard University in March 2017! Board member Chantal Kassa represented A2Empowerment at both conferences, and friend of A2Empowerment, Martine Tchitchihe, was a panel speaker on human rights and women's empowerment at the Harvard conference. Please check out our blog for more information. WPI Journal: Anne Cheung, a Worcester Polytechnic Institute Alumni, was featured in the WPI Journal for her volunteer work, including A2Empowerment! Twentieth Century Club: Anne Cheung was invited to speak on women's empowerment through education at the Twentieth Century Club, in Buffalo, New York, at the private women's club annual high school scholarship program. Local high school students were awarded prizes for essays about women from Western New York, who have made a difference to their community. Amazon Smile (link. Make sure you select A2E after following the link! ): Any purchase you make through Amazon can benefit A2Empowerment! Please sign up to support us through the AmazonSmile program! Social Media: Please keep in touch by following us on Facebook, Twitter, Instagram, and our blog! As always, thank you for your generosity, kindness and support. We are grateful for all that everyone does to support A2Empowerment. We are thrilled to report that we have awarded 234 scholarships, in 7 regions, for the 2016-2017 school year! One of the recipients, Fadima Adamou, who lives with her mother and four siblings and would like to be a university professor one day, noted on her application that the scholarship would help her "pay her school fees so that she doesn't have to get married right now." During the 2016/2017 school year, we will have 20 Peace Corps Volunteers (PCVs) and 4 Cameroonian mentors engaged in the A2Empowerment program, supporting scholarship recipients with monthly life skills-building meetings, academic counseling and community projects. 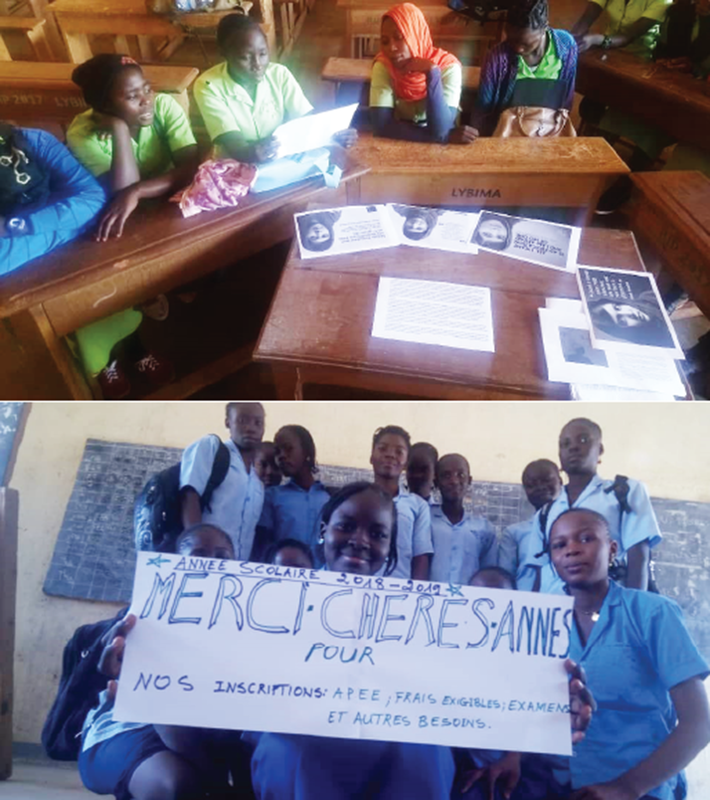 The A2Empowerment Board of Directors feels it is important to involve Cameroonian mentors so that the program can continue at schools even after PCVs complete their service, or in cases where PCV posts have closed for security reasons. As such, we are continuing to strengthen this program by doubling involvement, from 2 to 4 mentors this school year. All Cameroonian mentors are passionate about girls' education and have been screened by previous involvement in the program. We look forward to strengthening this aspect of our program in order to improve consistency, support and sustainability. We are writing to express our sincere gratitude towards your organization. Many of us are orphaned by at least one parent and finding school fees is a challenge, especially this year in the face of poor yields on our farms and at our fisheries. Through the A2Empowerment scholarship we feel proud that we have made it at least a bit easier on our parents and relatives at the start of the school year... As scholarship recipients we have worked hard to become role models in our school community in order to encourage our friends and classmates to work hard and get involved with school, too. Please visit our blog to read more about the exceptional students and mentors involved in our project. Lynne introducing Anne Rapin at AAUW. Photo courtesy of Gail Zichittella. A2Empowerment was invited to speak at the Buffalo Chapter of the American Association of University Women, or AAUW, to celebrate International Women's Day in March! Anne Rapin spoke of her time in Cameroon as a Peace Corps Volunteer, teaching in Binka, Cameroon, and the disparity in opportunities for girls and women in her village. The AAUW graciously made a $300 donation to A2Empowerment! We are so grateful for their support! An anonymous donor provided A2Empowerment with an extremely generous gift of $10,000 through the Minneapolis Foundation! We are excited and grateful to receive this special donation, as it will make a huge difference in the lives of the girls we support in Cameroon! 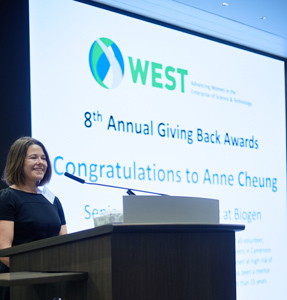 Anne Cheung was honored to receive a Women in the Enterprise of Science and Technology, or WEST, Giving Back Award in January for her volunteer contributions! Anne spoke at the event about her motivation to be a role model for her children and her passion for supporting education. Anne Cheung speaks at WEST. Photo courtesy of Man Ching Cheung. We are so proud of our superstar high school intern and future MIT freshman, Cindy, who asked for donations to A2Empowerment in lieu of high school graduation gifts, "because she believes all girls should have the opportunity to go to school." She raised more than $500 for girls' education in Cameroon! This summer we are proud to welcome back our outstanding high school intern, and future George Washington University freshman, Lilly! Her invaluable contributions to our social media platforms have substantially increased our visibility and outreach. We are so grateful for her help, as well as the assistance of all of our volunteers! Superstar interns! 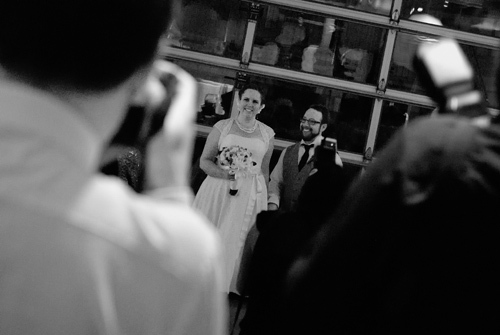 Photo courtesy of Anne Cheung. The A2Empowerment co-founders are funding the trademarking of the company name for protection and security. We thank Jacob Weintraub, of JWIP & PATENT SERVICES, LLC, (http://www.jwpatents.com/ ) for graciously providing his services. 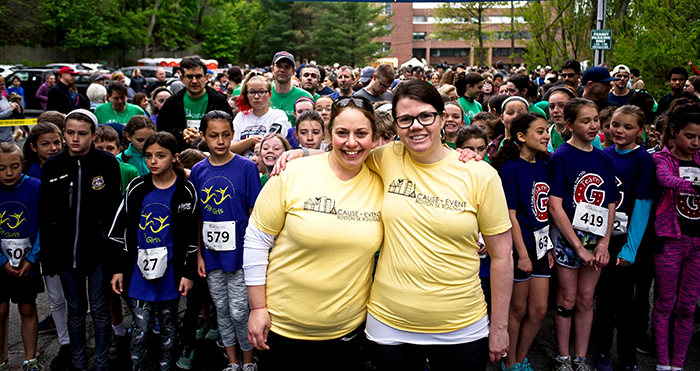 On May 22nd, more than 40 A2Empowerment runners and volunteers participated in the 2nd annual Cause + Event 5K in Arlington, MA, which raises money for local nonprofit teams! 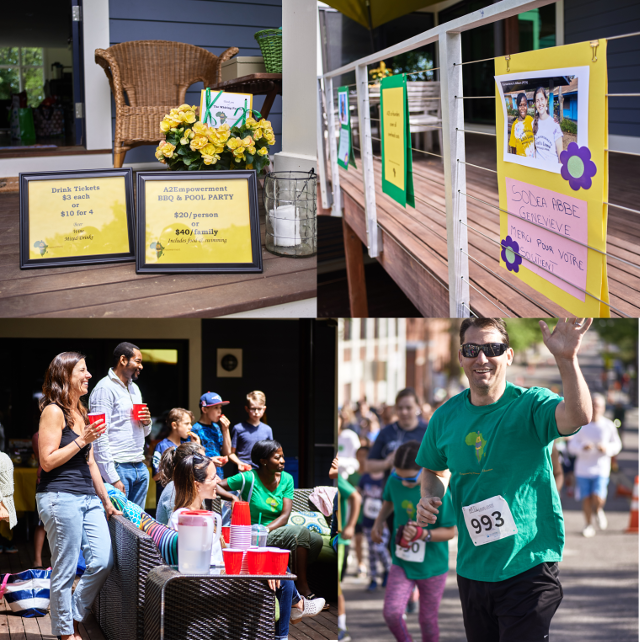 This incredible race and its organizers did so well that two-thirds of all registration fees were applied to our cause, raising approximately $800 for A2Empowerment! Special thanks to the race organizers, Julie and Robin, and all volunteers, including Christa and Man Ching! 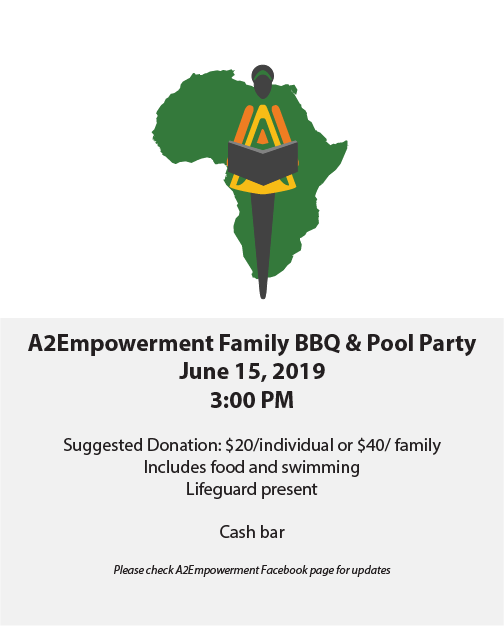 Following the Cause + Event race, Lori and Pete Whiting graciously organized an A2Empowerment BBQ and Pool Party at their home! 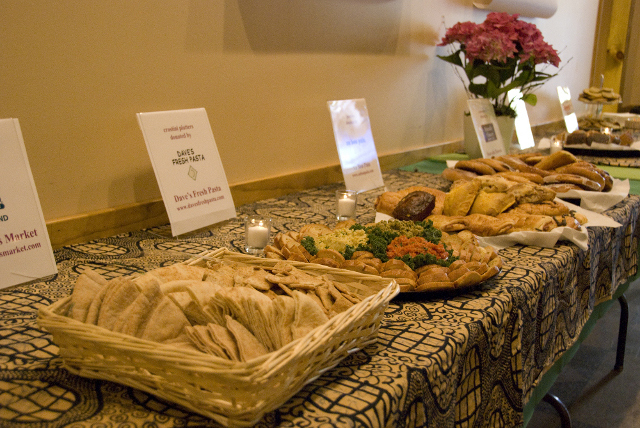 This event raised over $5,000 for girls' education in Cameroon! We are deeply indebted to the Whiting, Kokinos, Wood, Rushe, Abo, and Cheung families for their generous contributions. Special thanks to our volunteers, Lori, Pete, Deborah, Johanna, Katie, Mia, Maeve, Lilly, Jackie, Melissa, Eugénie, Nate, Maureen, Ben, Gail and Man Ching for their time and incredible generosity! Thank you to the local businesses who donated raffle items, including Quad Cycles, Alton Street Boxing & Fitness, Back Bay Fit, Blue Ribbon BBQ, Arlington Recreation, Not Your Average Joe's, Attorney Jan Whiting, Black Crow Yoga, Great Harvest and Zhen Ren Chuan! Volunteers at Cause and Event 5K! The race was won by Ryan Abo (middle picture)! Cindy Shi (top row, middle picture) came in 3rd in her age group! Photo courtesy of Man Ching Cheung. As always, thank you from the bottom of our hearts for your support. We hope we always make you proud. Photos provided by Alex Slepchuk, Kathleen Kirsch, Alex Hall, and Antoine Hiobi. The 2015/2016 School year is off to a great start! This year we are supporting 218 scholars, 10 of which became part of the A2Empowerment program through our adoption of the Opportunity Africa program mentioned below. In addition we have paired two long time donors with two students who are beginning university level studies! My A2Empowerment girls are all Upper Sixth students, toughing it out through the last year of high schools and national exams. A2Empowerment has been a great experience, and recently we discussed volunteering and the importance of giving back to the community. The girls were optimistic enough to sign on to helping me with the World Map Project! A few long weekends later, it came together and we all signed it with our painted hand prints. One of the girls joked that, "after this, they better pass their next geography exam!" Through the efforts of Kali Cheung and Graham Button, A2Empowerment was able to release a new version of our toolkit for the volunteers to use when they host scholarship recipients in monthly gatherings. The toolkit should help build life skills like goal setting, budgeting and critical thinking. Volunteers are reporting that the girls are excited to participate in monthly meetings, and some of them have even started setting aside a few francs each week for future needs, such as school supplies! You may have heard of the Millennium Development Goals; a set of eight goals that the UN decided developing countries should reach for through the end of 2015. Already we know that some goals were met, others showed significant progress and a few proved more challenging. As a follow up, the United Nations has now decided on 17 global goals called the Sustainable Development Goals, or SDGs, to work toward for the next 15 years. A2Empowerment's mission aligns with several of the SDGs but most closely with two specific goals: #4 - Ensure inclusive and equitable quality education and promote lifelong learning opportunities for all, and #5 - Achieve gender equality and empower all women and girls. We look forward to doing our small part in accomplishing these goals! Katie Abo, who asked her friends and family to make a donation to A2Empowerment instead of giving her birthday gifts, and will send 5 students to school! Gloria LaSota and Lynne Rapin who, in addition to being regular donors, provided A2Empowerment branded book bags for all of the scholarship recipients! Claire Kelly, an RPCV who was posted in the Extreme North of Cameroon, swam the 7km Traverse Dakar Goree in Senegal as a fundraiser for A2Empowerment, raising $1,753! Margaret and Anthony Leone who shipped 1,400 pencils to students in Cameroon! JumboCode, a team of seven undergraduate computer science students from Tufts University, who are helping us set up an automated banking system so that we can spend more time exchanging ideas and stories with volunteers and less time focused on accounting! Superstar A2Empowerment supporters, Christa Houlahan and Johanna Wood, volunteered to speak to the students about their experience and career opportunities in the technology field. Interns Lilly Skerlj and Jesse Hammond did an amazing job! Lilly maintained all of our social media and started our blog! Jesse developed a presentation for us to use to publicize our program! The bag was designed by Lynne Rapin and Gloria LaSota. A2Empowerment is also very thankful to have been awarded a $5,000 grant from the Minneapolis Foundation! These funds will help support general operating costs, including money transfer fees and transport expenses to our Cameroonian coordinator, Alim, who has been doing a fantastic job of coordinating scholarships in the Extreme North and North regions following PCV post closures due to Boko Haram activity, to continue to ensure that 100% of all donations are put toward scholarships. In September of this year, Opportunity Africa handed its scholarship program over to A2Empowerment. We are transitioning students and a volunteer coordinator from the Opportunity Africa program to the A2Empowerment scholarship cycle. By joining these programs we were also able to expand our capacity to support university students with full and partial scholarships. Through our A2Empowerment model we connect a university student to an individual donor who supports the student's studies through university. 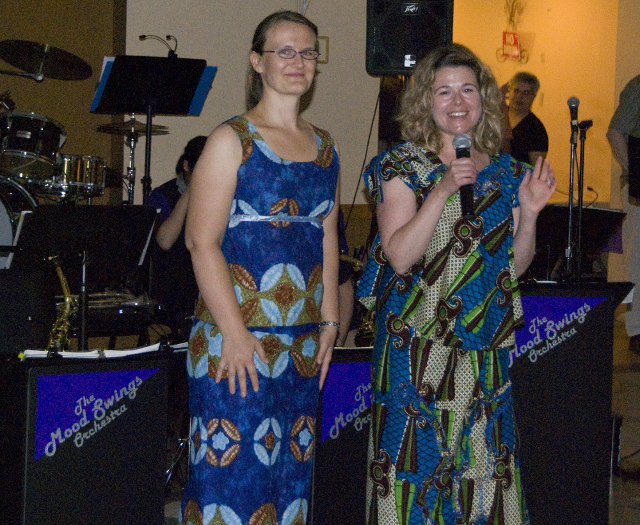 Through the Opportunity Africa model we have one donor, Daniele Fogel, who decided to split the money she raised to provide partial scholarships to six university students. 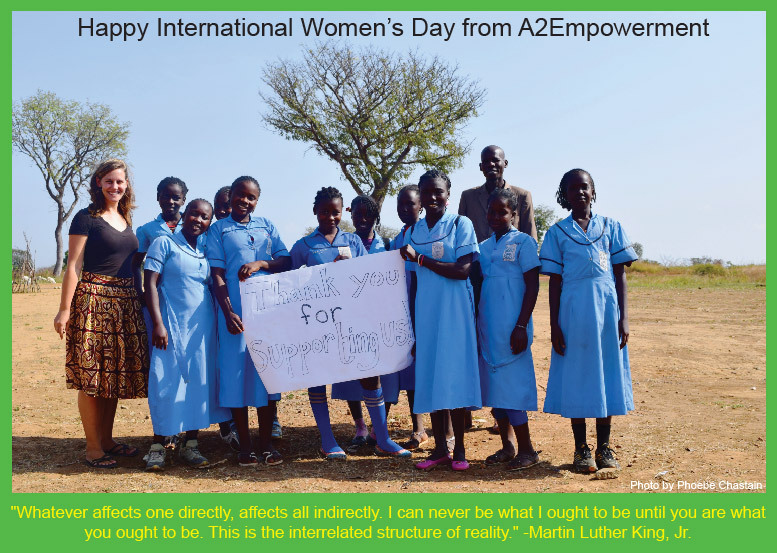 A2Empowerment is a charity organization listed on AmazonSmile. Please consider supporting our organization when shopping on Amazon using A2Empowerment's page on AmazonSmile. You'll log into Amazon, shop like normal, and Amazon will donate 0.5% of what you spend to A2Empowerment! Please follow us on Facebook, Twitter and Instagram, and please subscribe to our blog! We love to hear from you and stay in touch! We are so grateful for your support! We wish you very happy holidays!! We are thrilled to announce that we will be awarding more than 200 scholarships in 2015! We look forward to working with the 18 volunteer mentors in 8 regions of Cameroon to offer guidance and support to the girls throughout the school year! Please visit our website to read about the 2014 scholarship recipients. As scholarship recipient Abbe Leonce writes in her thank you letter, "The scholarship not only helps me to still be in school, but, also, helps my family to not be worried about me getting back to school. I am not worried to be sent into a pre-arranged wedding anymore, which would be the case if I didn't get this scholarship. Now I can dream big and help back someday." Anne Cheung was recently named to the 2015 Heroes of the 500 list by Fortune magazine! Anne was nominated for her work on the A2Empowerment program by her employer, Biogen. More than 15 runners and volunteers participated in the first Cause + Event 5K on May 17th, a unique race benefiting many nonprofits! 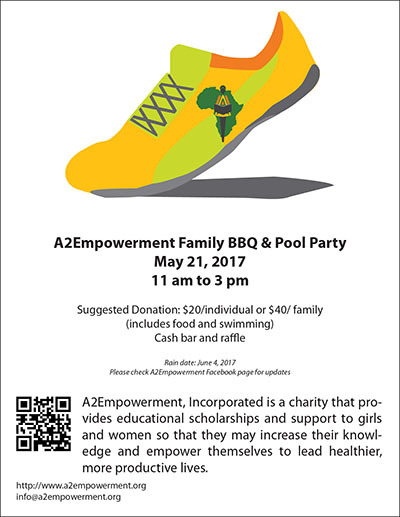 A2Empowerment raised over $250 through participation in the race and post-race BBQ, graciously hosted by the Wood family. A2Empowerment racers joined in Arlington, MA, as well as virtually, in Buffalo and New York City. 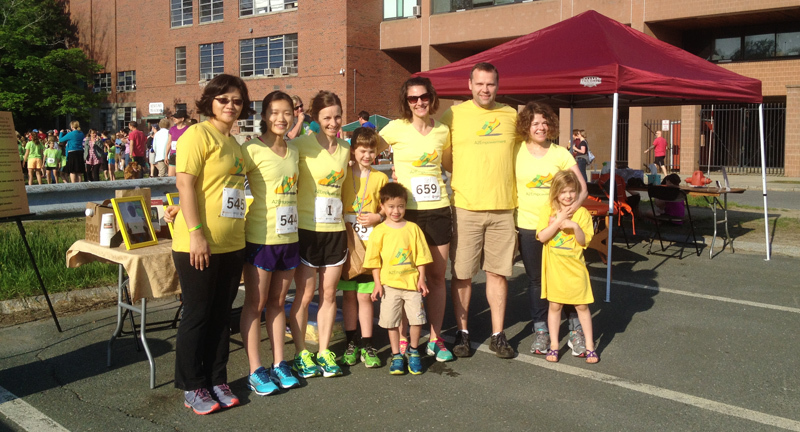 A special thank you to race volunteers, Sally Dupere , Man Ching Cheung, Simon Cheung, Eugénie Olson and Lilly Skerlj! Congratulations to all of our racers, including our top finishers: Katie Abo 3rd/74 (22nd overall); Eric Mellyn 2nd/15 (34th overall); Cindy Shi, in her first 5K ever(! ), 8th/244 (39th overall); Johanna Wood 2nd/118 (50th overall)! Have you noticed more A2E social media presence this spring? That's all thanks to high school volunteer intern, Hana Robin- Caplan! Hana did research on increasing our social media skills, and applied her research directly by creating the accounts we were missing and updating them frequently. We look forward to working with our new interns, Lilly Skerlj and Jesse Hammond this summer! 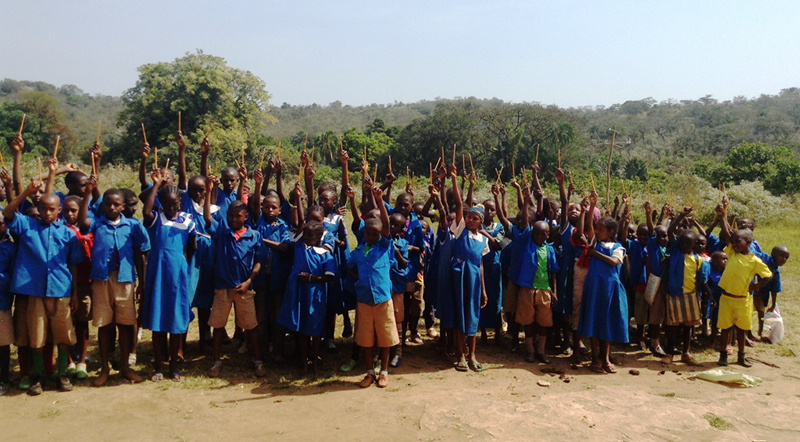 Peace Corps Volunteer, Sean Gray, sent these amazing photos of the pencil donation in GS Sangwa. A big thank you to Maggie and Anthony Leone for sending 1,200 pencils to Cameroon! We welcome the newest member of our Board of Directors, Chantal Kassa! 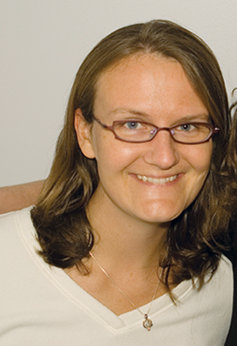 Chantal is a busy mother, teacher and student who holds a Master of Arts degree in International Development and Social Change from Clark University in Worcester. She is a skilled Education Specialist with over 10 years work experience as a teacher, instructional technologist and research associate at public/private schools, community college and non-profit organizations. 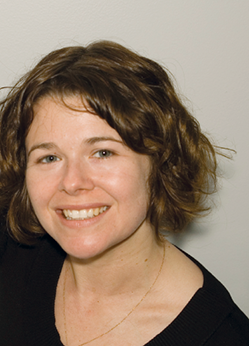 Chantal offers constant guidance, and currently heads our intern program. We are so excited to have her join our team! We are overjoyed to join with Opportunity Africa to award scholarships beginning in 2015! 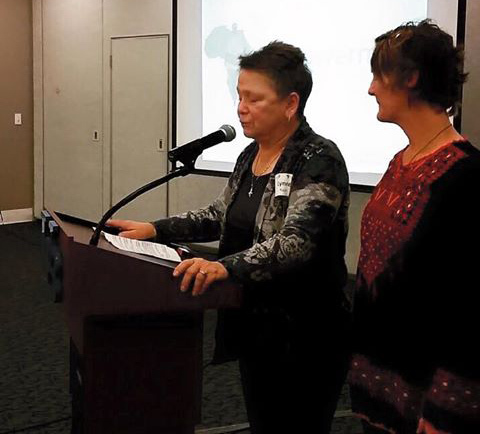 Our collaborators, Heather Buesseler and Martine Tchitchihe, have made outstanding contributions toward education in Cameroon, and we are so glad to work with them to have even greater impact! Martine supported A2Empowerment in Cameroon and was recently recognized by Nobel Peace Prize awardee Malala Yousafzai as her #GirlHero. The Cameroonian Social Club of New England will hold it's annual celebration on July 25th in Watertown, MA. If you are an RPCV interested in attending, please check out their website for information. The food and dancing are bound to be AWESOME! Photos provided by Jean Richard Tarcice, Alim Ousmanou, and Rebecca Braun. During this season of giving, we know you receive many requests for donations. If you would like to donate toward girls' education this holiday, we ask you to consider making a donation to a fund-sourcing campaign to raise money to support a position for Martine Tchitchihe at Opportunity Africa, a Minnesota nonprofit company collaborating with us to provide education in Cameroon. Martine's story is compelling, and she is exactly the type of girl we focus on. She is a longtime supporter of the A2Empowerment program, working with Peace Corps Volunteers to facilitate the program in Maroua, Cameroon. In response to harassment and violence against her by members of Boko Haram, Martine is currently seeking asylum in the United States. She was honored as a "Girl Hero" by Malala Yousafzai for her perseverance in the face of unspeakable adversity and continued passion for education. Now Martine needs our support to remain safely in the United States, so we are asking for your support. Although your donation to this campaign will not go directly toward girls' scholarships, and it will not be tax deductible, the investment in Martine's future will ensure the continued success of efforts by Opportunity Africa and A2Empowerment. In addition, Martine's passion for education and efforts on behalf of students in Cameroon will have an infinite and invaluable impact on girls' education. Even if you are unable to make a donation at this time, we hope you will visit the links below to hear more about Martine's amazing story. We are so proud of her! Scholarship recipients in Garoua, courtesy of Alim Ousmanou. 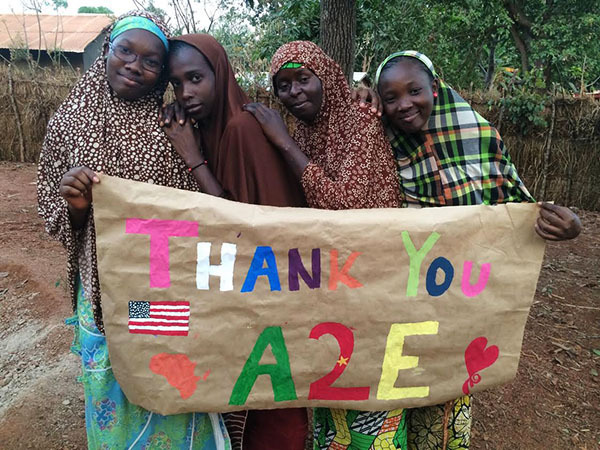 We overcame challenges, like changes in the Peace Corps Partnership Program Grant process and several Peace Corps Volunteer post closures in response to Boko Haram activity, to award a final total of 217 scholarships in 2014, the largest number in our 7 year history! We'd like to thank the accommodating Peace Corps Volunteers who either submitted the grant or found trustworthy counterparts for us to work with, the outstanding counterparts going above and beyond for the program, and the Peace Corps Cameroon Staff for their outstanding support, patience and assistance! Initially we thought we'd be unable to continue funding scholarships in the Extreme North, along with certain parts of the North and Adamaoua regions no longer holding posts for Peace Corps Volunteers for security reasons, but working with RPCV Kalene Resler and our main Cameroonian contact, Alim Ousmanou, we are funding 23 scholarships in those regions! We'd like to thank all of the PCVs and RPCVs who have made this possible, especially Kalene, Sarah Mae Jennings, Claire Kelly and Katie Ouimet, who ranked the applications under aggressive time constraints! PCVs and A2Empowerment. We are grateful to Peace Corps Cameroon for creating this position, and excited to be working with Graham! Upon hearing one of Anne Rapin's stories from Cameroon of siblings of her students interrupting her class to borrow pencils because the family didn't have enough money to purchase one for every child, A2Empowerment supporters Maggie and Anthony Leone generously arranged to purchase, collect and ship 1,200 pencils to PCVs to distribute in Cameroon, at shipping costs close to $200! The pencils have yet to arrive, but we know the girls will be forever grateful! On December 4th, A2Empowerment will be exhibiting at the Massachusetts Conference for Women, in Boston, MA! If you plan to attend the conference, please visit us at booth 337! We will be raising awareness about A2Empowerment and girls' education, and we will be accepting donations. We'll offer gift boxes containing a card that says "a donation was made in your honor" for donors to give to loved ones. If you are interested in giving an A2Empowerment gift box, but you are unable to attend the conference, please email us by December 1st at a2empowerment@gmail.com for information. On Cyber Monday, please consider supporting A2Empowerment through AmazonSmile! It's the same Amazon products, prices and service, AND they will donate 0.5% of the price of your eligible AmazonSmile purchases to our organization. To find out more and start shopping, please visit the AmazonSmile website. Please follow us on Twitter (@a2empowerment) and Facebook to receive updates! 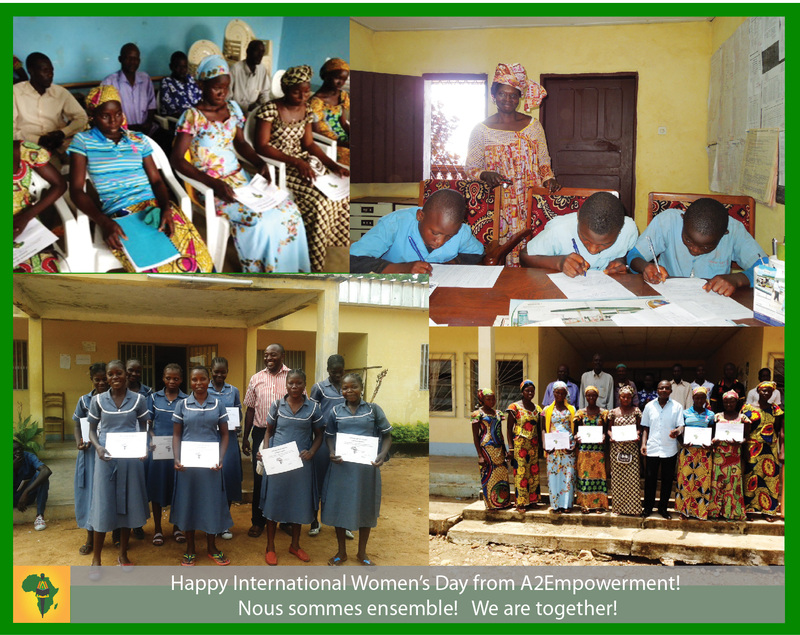 And please email us at a2empowerment@gmail.com if you'd like to volunteer to help us support girls' education through fundraising, grant writing, and/or scholarship application review. A2Empowerment gives thanks for your support, and we wish you a happy and healthy Thanksgiving! 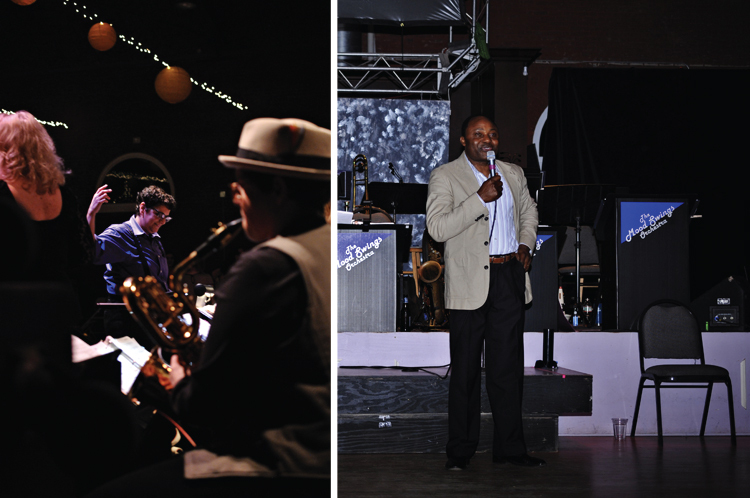 Our March 8, 2014 International Women's Day celebration, featuring The Mood Swings Orchestra and dance instruction from Liz Nania of OUT to Dance, was a huge success, raising over $8,700 for girls' education! Dancers at the Center for Arts at the Armory took lessons from Liz Nania, of OUT to Dance. Photos courtesy of Krystina Nguyen. Bandleader Judy George and Alex Mbianda, a Cameroonian now living in the United States. Photos courtesy of Man Ching Cheung. What has A2Empowerment been up to? 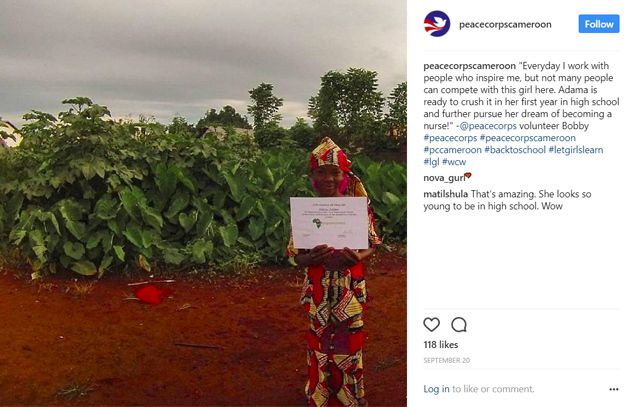 Funds for tuition, books and fees have been distributed by Peace Corps Volunteers, or PCVs, to enroll the 99 young women awarded scholarships in seven regions of Cameroon for the 2013-2014 school year. Over the summer, PCV Katie Ouimet, based in the village of Bansoa, sent this picture to us of the seven scholarship recipients she enrolled in the West Region of Cameroon. Scholarship recipients in the West Region of Cameroon. Enrollment in the North and Extreme North Regions of Cameroon was complicated this year. Just as we finished selecting the scholarship recipients, Peace Corps made the decision to close posts in the North and Extreme North Regions of Cameroon for security reasons. This was in response to the kidnapping of a French family by Boko Haram in February. The posts were closed indefinitely; PCVs were evacuated from their posts, meaning that 29 girls would not be able to receive their scholarships. The PCVs who still had ties to those regions assisted us by contacting their trusted Cameroonian counterparts to enlist their help and become our A2Empowerment Community Point Persons, or CPPs. Mural painting in the North West Region of Cameroon. Eight CPPs came together to receive training on the A2Empowerment program and they will be mentoring the scholarship recipients throughout the school year. A2Empowerment is greatly appreciative to PCV Sarah Mae Jennings, the organizer of this pilot program, as well as PCVs Laura Miller, Kalene Resler, Kathleen Smith and Graham Button who developed and facilitated the training sessions so that we were able to continue to sponsor girls in these regions. We are using this opportunity of relying on CPPs to increase capacity building for Cameroonians in the communities where A2Empowerment is providing scholarships. 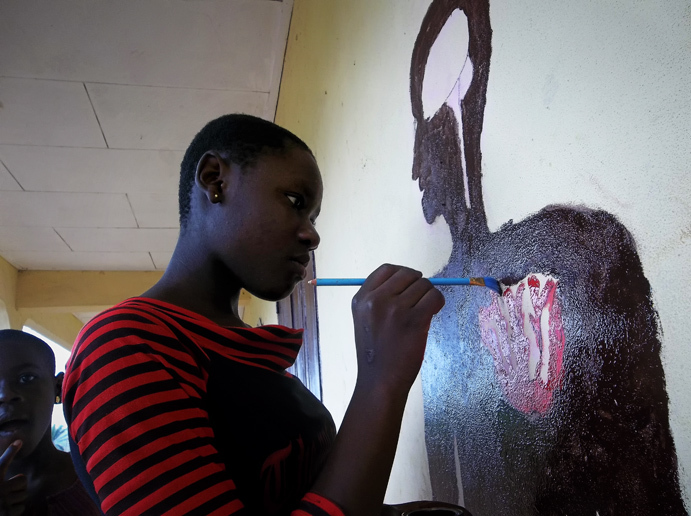 PCV Amy Boyd organized a mural painting project with A2Empowerment Scholarship recipients and area children in the North West Region of Cameroon. The extremely generous and kindhearted newlyweds, Christa Houlahan and Matt Drake, invited their wedding guests to make a donation to A2Empowerment in lieu of a standard wedding gift registry! They raised an astounding $3,440! Upon recommendation from her niece, PCV Kalene Resler, Lisa Richards read "Half the Sky" and decided to choose it as the book for her group's book club. The club members were so inspired by the book that they wanted to do more for women's empowerment by collecting money within the group for A2Empowerment! They collected enough to send two girls to school! 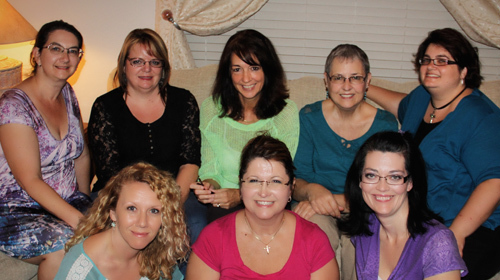 Book club members: (top row) Amanda Austin, Donna Cook, Lisa Richards, Pat Davis, Colleen Kolb; (bottom row) Krystal Ford, Lori Christiansen, and Tina Mollica; book club members Katherine Vargas and Kim Crawford are absent from the photo. 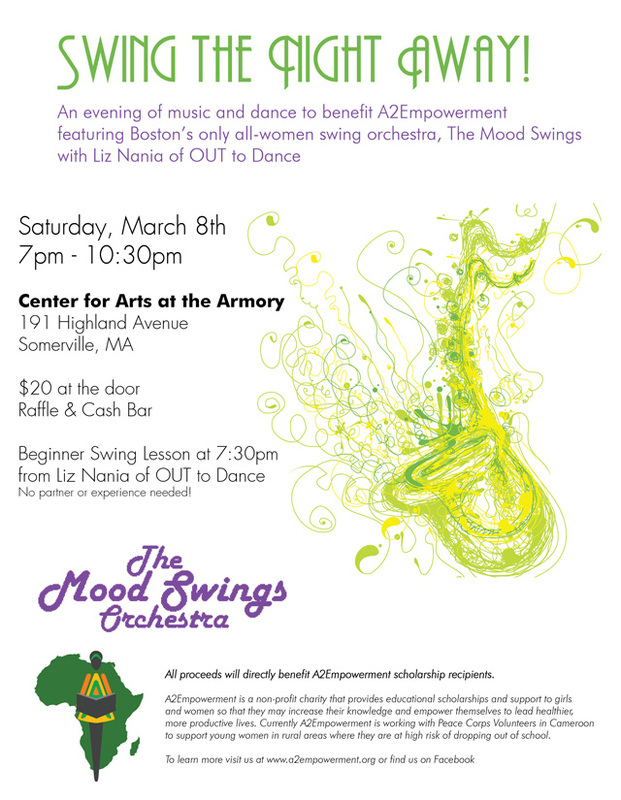 In honor of International Women's Day, on Saturday, March 8th, A2Empowerment will hold a fabulous fundraiser in the Boston area featuring Boston's only all-women swing band, The Mood Swings! Whether near or far, if you would like to volunteer your time to help organize this event, please contact us at a2empowerment@gmail.com. We've started a new scholarship cycle! We are currently preparing information on the current scholarship recipients to share with you this spring, and we've begun the application cycle for the 2014-2015 school year. We are thrilled to continue with this project and we thank you from the bottom of our hearts for your generous support! Happy International Women's Day from A2Empowerment! 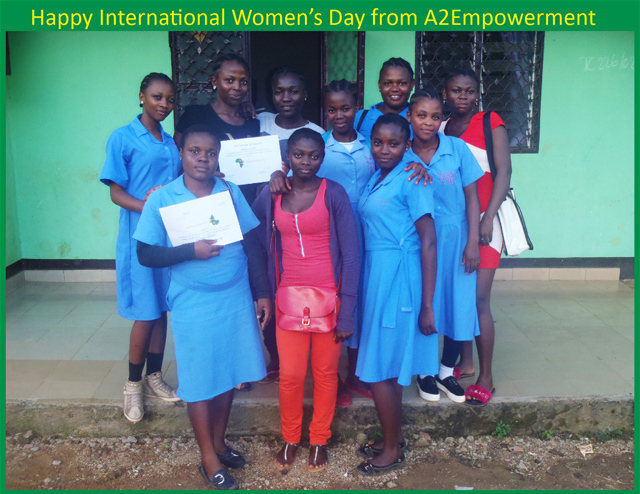 On this day, to honor women and promote gender equality, we remind you of the young women you have empowered in Cameroon. It is our honor to have your support and we thank you, on behalf of the girls, for your incredible generosity. "Louise is the youngest of 14 children and a student at one of the Meiganga women's centers. She lives with her mom and several of her older siblings. She's very outgoing and always smiling. She's a leader among her classmates at the center and is never afraid to speak her opinion during class. She loves dancing and sewing and wants to open up her own tailor shop one day." We will continue to honor Louise's life through our charitable work. 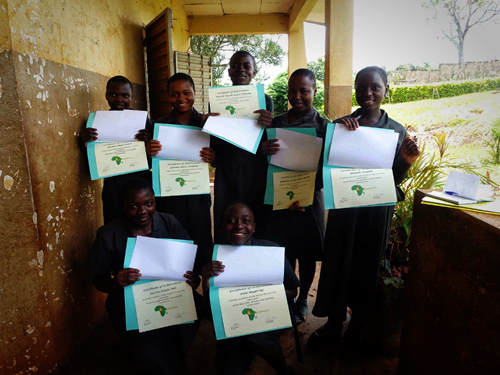 It is our pleasure to introduce you to several of the 60 girls awarded scholarships in 2012. We hope these notes of gratitude illustrate to you how deeply your support matters to the scholarship recipients and how you have inspired them. As scholarship recipient Sylvie Forkwa writes, "With this support given to me, I promise that I will work harder so that at the end, I will turn to help others who do not have." We are thrilled to announce that we plan to award 99 scholarships in the 2013-2014 academic year! With the help of incredibly amazing Peace Corps Volunteers from 7 of the 10 regions of Cameroon, we will be supporting insightful young women, like Nadium Yvette Kuma (17 years old) who writes, "I am an orphan and many of my relatives prefer to support the boys' education because they believe that girls are meant to get married. I want to continue my studies because the society in which I come from, women are not considered important. They are simply good as housewife. I do not want to end my life as a victim of marginalization. I want to be an educated mother and wife so I can help my children in an educated and civilized way. I would want to have a good paying job. For example, I want to be a teacher. In my society one can only have a job if he or she have been to school." We are so pleased and honored to announce that Returned Peace Corps Volunteers Emily Strauss and Claire Hutchinson have joined the A2Empowerment Board of Directors! Both women have proven their dedication to our organization over the years and we are delighted to have their help! 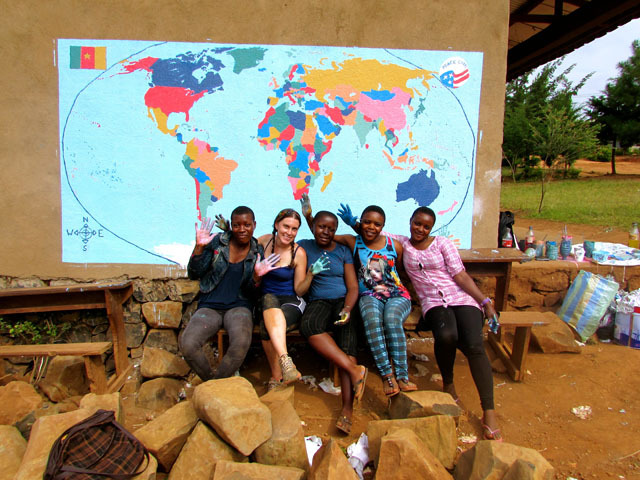 Emily was the very first Peace Corps Volunteer to design and work on the project as a volunteer in Belel, in the Adamoua Region of Cameroon. Claire Hutchinson was a volunteer in Meiganga, in the Adamoua Region, who supported 14 girls and bravely hosted a visit from Anne Cheung. As always, we are honored to have your support and thank you from the bottom of our hearts. The marathon was a success! Both Annes finished the Chicago Marathon and we exceeded our fundraising goal, raising over $7,160 to fund scholarships for girls in Cameroon! We send a HUGE thank you to all of our donors!! In addition, Kali Cheung, and returned volunteers Melanie Emmen, Ali Starling and Claire Hutchinson, held fundraisers to aid us in funding this cycle's scholarships. In the Adamaoua Region, PCV's Danielle Nicolai and Emma Jehle sent us a photo from the ceremony they held to give out the scholarships and certificates. A guardian for each girl was invited as well as the principals from each school and other important community figures. Speeches were made by both Emma and Danielle as well as the principals in attendance. Everyone, especially the girls' mothers(! ), was proud of the recipients and they celebrated with cakes and soda. At the first meeting with the recipients Danielle and Emma will be helping the girls set goals for the school year. As a Peace Corps Volunteer, taking part in the A2 Empowerment program has given me an invaluable chance to connect with young women and form the kind of one-on-one mentoring relationships that I find the most satisfying aspect of my service in Cameroon. The timeline of the program has let my four girls and I get to know each other over many months, and in that time I've seen them open up, develop more confidence and trust in sharing their opinions, and become proud of their scholarship and what it represents. One of my recipients had twin girls a couple of years ago, had to drop out of school to care for them, and then stayed out due to family financial stress. This year she is returning to school enthusiastic and dedicated to passing her major year-end exams. She has found an aunt willing to take care of her daughters for the year, and says she wants to show her parents and me that we did not make a mistake in choosing her, that she will make the most of this opportunity. The family of each recipient was thrilled that their daughter would be receiving financial aid - the modest scholarship is making a major difference in helping them cover other important family needs. But even more special to me was being present in each household as I announced that Christelle, Kevine, Dolgeline or Viviane had been specialed out for her hard work, ambition and promise. It's an honor for the whole family, and also a great reminder for the male head of the household especially that educating young women is a hugely important and valuable investment. When those across the world express that view through supporting this kind of program, it helps parents and community members here get on board and take more pride and ownership in young women's futures. A2 Empowerment therefore helps girls, families and the community not only by keeping recipients in school but by helping them see education for females differently. Add to that the intimate conversations, life skills education and personal growth that occurs during the additional programming that Peace Corps Volunteers provide, and what started out as a scholarship turns into a unique and special support system. In the North, PCV Sterling Thomason contacted us about a former scholarship recipient, Monique, who finished high school and wanted to study law or education at the local university. 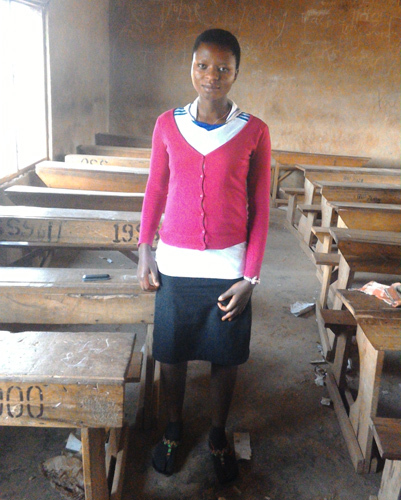 We were able to add this new dimension to our program thanks to a very generous donor who offered to support Monique, who has just begun her first year at the University of Ngaoundere! If you are interested in supporting a university student please let us know! As you can see, your donations touch a lot of lives. They bring smiles to faces and induce a sense of pride and empowerment in the recipients, their families, the volunteers who work with the recipients - and US! THANK YOU! We have recently begun the scholarship application cycle for the 2013/2014 school year. Several Returned Peace Corps Volunteers, who worked with us during their service in Cameroon, have offered to help us translate applications. This cycle, Andrea Drager, posted in the South Region of Cameroon, inquired to find out when we'll be expanding to the South and indicated that the need for the program had even made it into the local music. She provided us with the lyrics to new a Bikutsi song (a Southern/Center musical genre): "Donne moi la mathematique et non le cours de 'tics'..." In English "Give me math class, not a class on getting laid". We hope to expand to the South, as well as the East, regions in the 2013/2014 school year. We look forward to continued success and we thank you for your amazing support! Have you ever thought about running a marathon? Have you run several and want another one under your belt? If you've answered yes to either of these questions, then please consider joining the A2Empowerment Marathon Challenge 2012! Register for a 2012 fall marathon, preferably Chicago since A2Empowerment co-founder(s) plan to run this race. Train with us: virtually or in person if you're in the Boston or NYC area. Fund raise with us: we supply a fundraising site and materials. Run and celebrate your marathon with us: in Chicago, we'll plan a meeting spot before and after the race. 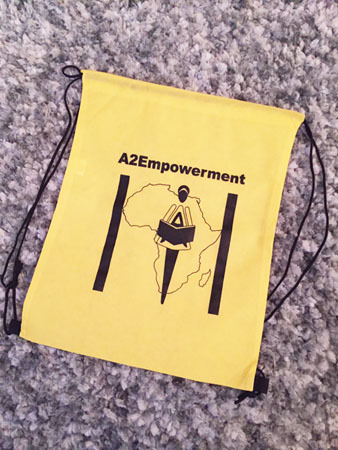 We'll supply all participants with an A2Empowerment shirt. Anne Rapin and Anne Cheung will personally reimburse the marathon registration fee for the first 5 people who raise $1,000 (marathon fundraising will not begin until August). October 7, 2012 RUN CHICAGO!!! We've attached related links below. If you have questions after reading over the links, please feel free to email us. If you have never run a marathon, we can send you information on how to build up to the official marathon training. If you will be joining us for the A2Empowerment Marathon Challenge 2012, please respond to this email to be put on our marathon email list. Thank you for your time and consideration. We hope to see you on October 7, 2012! 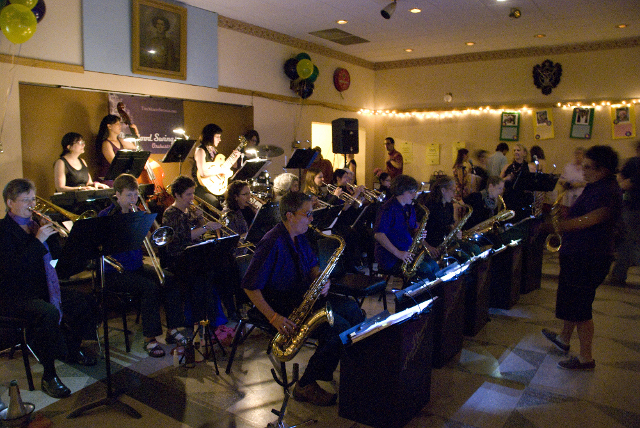 Our June 18, 2011 benefit, featuring The Mood Swings, was a huge success! We raised over $6500 -- at the current rate, that's 100+ scholarships! 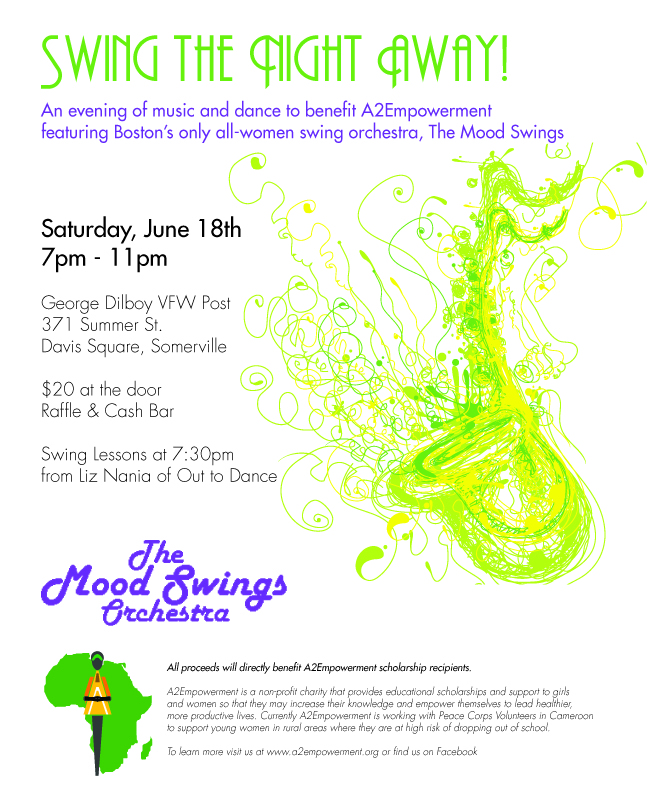 A special thank you to The Mood Swings, Boston's only all women swing orchestra, for donating their performance. Photos courtesy of Christa Houlahan. 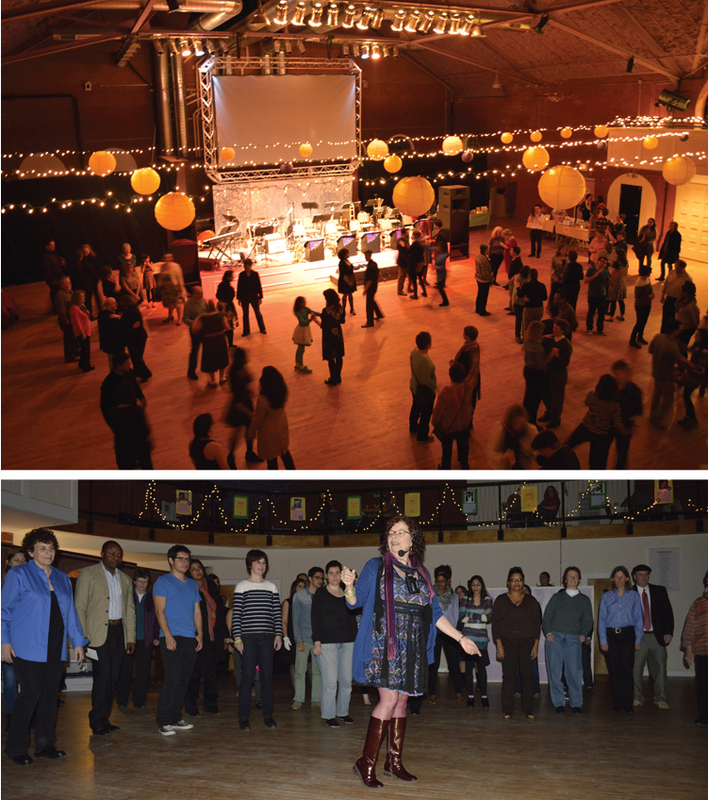 Thank you to Liz Nania, director of Out to Dance for donating her time to teach us swing dancin'! Co-founders Anne Rapin and Anne Cheung thank the A2Empowerment supporters. 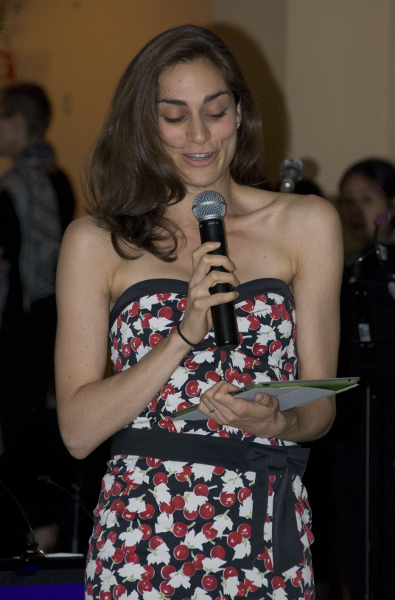 Returned Peace Corps Volunteer Emily Strauss describes the circumstances of the scholarship recipients. We want to thank Christa Houlahan for designing and printing posters and fliers for the event. Returned Peace Corps Volunteer Allison Sanders did amazing work, putting together a slide show presentation about the scholarship recipients. We also thank Shelly Martin for donating a Game On gift certificate and Lois Contreras and Shelby Hunter for helping throughout the night. 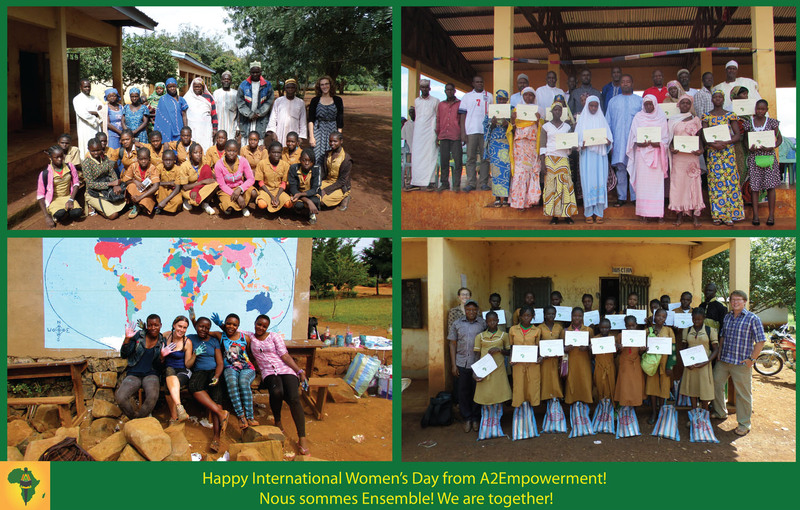 And most of all, thank you for supporting the women of Cameroon!